women. Before the war, for upper class women, the home was a haven of femininity and chivalry. For the Southern woman, the house slaves took care of the cooking, cleaning and care of children.And, of course, the field slaves handled the crops and livestock. 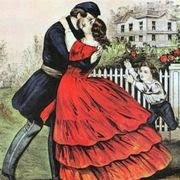 But when war was declared and the women had to bid their husbands, fathers and brothers good-bye, all of that proper society was turned upside-down. Many of the slaves initially remained on the plantations in the South, but as the war wore on, more and more of them left. Women took to the fields themselves to harvest the crops, along with their children. Eventually most of the plantations collapsed under the devastation of the Union Army ravaging their livestock and food. 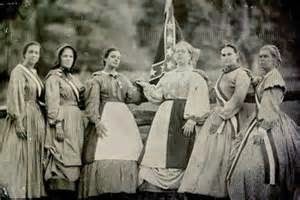 Lower class women fared even worse, as they struggled simply to feed themselves and their children. Some women followed their men onto the battle field, cooking and nursing as the battles raged around them. Nursing had traditional been a man's domain up until this time, but as the male population became more and more decimated, the women assumed that role. Every facility available became a hospital, from churches to front porches, and the women tended to the wounded. In the North women organized sewing societies to make blankets, flags, and knit scarves and socks for their loved ones. They canned food, planted vegetable gardens and raised funds for medical supplies. Some women, on both sides, disguised themselves as men and fought alongside the men. On both sides there were women who acted as spies. 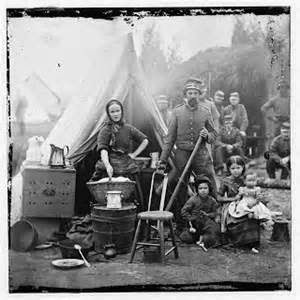 Perhaps more than any other war, the Civil War shifted the roles of women from keepers at home to serving in an active position in society. I can't help but think how women always rise to the occasion when called upon.